Other than running? (ha!) concerts, good books, traveling. I’ve been a runner since I can remember. I love the feeling of being active, enjoy the endorphin rush, and the alone time to just be with my thoughts. During the Chicago marathon 2005 (at the time sponsored by Lasalle Bank,) Just soaking up the race atmosphere. Finished the marathon, and didn’t feel anything other than being happy to cross the line. IT wasn’t until 2 days later that the magnitude of what I had accomplished overcame me, and I was a little teary eyed while running on the treadmill. It was a good feeling. 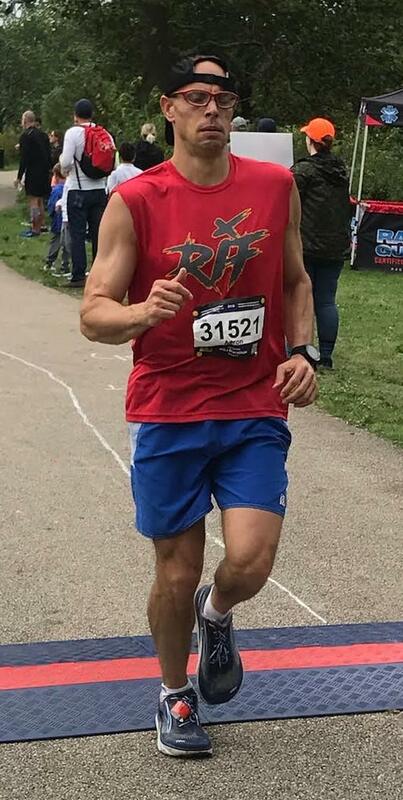 Other than loving to get a chance to run as often as possible, I enjoy helping first timers cross that finish line or getting a PR. It is a life changer. I was pacing a marathon with my friend and fellow 50 state finisher Heather Zeigler. We were right on pace, at mile 24 we told everyone with us if they were feeling good, to just pick up the pace a little and try to finish in front of us for their sub 4s. We ran the final 2.2 miles picking up some people who managed to stay with us, crossing the line in 3:59:57. Perfect day, perfect pacing. I’ve come to realize that most people, even first timers, want a pacer who knows how to encourage them when needed, and at other times, stay quiet and keep the pace. If you have been trying and want that elusive sub-4, I’ll get you across that finish line on time. I take the first mile a little slower to get into the groove, and generally try to keep even splits, give or take a few seconds.